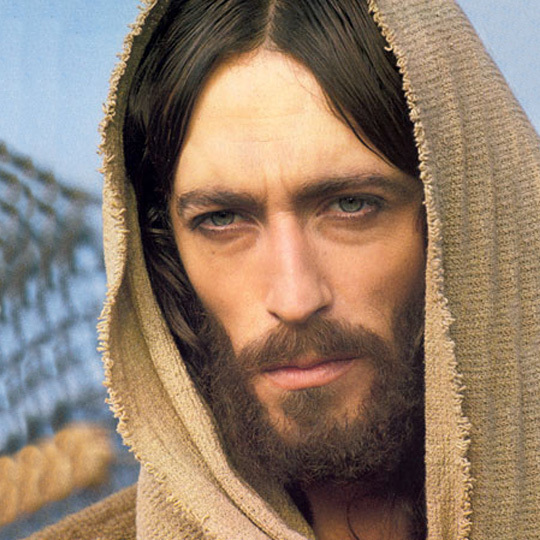 Robert Powell in Jesus of Nazareth. Best. Jesus. EVER. The barn I board at has a great saddle fitter named M------. I've used him, he is excellent! Funny, experienced, competent, reasonably priced to boot, what more can you ask? But it is funny how people like that become larger than life. Our confidence in him is such that it almost deserves to be mocked (just a little). M------ felt my County should fit just fine, and probably it should, but it does not. Riley's pinned ears are the proof. When I lamented that M----- was mistaken, a boarder joked with me. "Shhh! He's almost like Jesus around here." Out of desperation more than anything, I'm going for a second opinion on my saddle, and also one I have on trial. I'm a little embarrassed about telling people -- partly because of the money I'm spending, and partly because I'm using another fitter and not the Saddle Savior. The second fitter is coming out at 7pm Thursday, and I'm kind of relieved I don't have to explain the visit to anyone. I want to hear that my County is fixable, and that my BC trial saddle is a good fit. I like options. But I guess praying is out of the question. Riley knows best. Our horses will always tell us more than any human every can. Trouble with saddle fitting is that once the horse starts to move, the back changes and if the saddle isn't exactly right, it no longer fits. Hope the second fitter becomes the true messiah in this situation, or that the BC works out. Not being able to ride due to a tack "malfunction" is no fun at all. Still rooting for the Ansur, but if Riley finds a treed saddle he likes, that's nearly as good. Wishing you luck on your "secret" mission. Last Spring, before we got to the root of my mare's club foot issues, I wanted to question our farrier on his methods. My husband was adament that I NOT do this...what if he got angry and quit on us? (I could have cared less at the time) So I understand the 'Jesus' syndrome with horse people! As someone with a notoriously hard-to-fit breed, I sympathize. I've had some really bad luck with the saddle fitters in my area, to the point where I'm nervous about seeking any others out and handing over my money. There's one in particular that everyone swears by, but after watching him work a few times and watching the horses he fitted over the course of a few months (and a few new fittings) I wasn't that impressed. Recently a friend used him, and not only does the saddle he adjusted obviously NOT fit, it rubbed a wide bald patch under the back of the saddle -- I've never even SEEN such a mark caused by tack, and I've seen some pretty awful set-ups in my time. A different friend from the one above happened to borrow a saddle, which didn't look like it fit AT ALL (even earned an "Oh my" from the chiropractor), but they completed multiple endurance rides and all the conditioning miles in-between without a single back-related complaint. Ha! I glanced the title and read Salivation... both fitting for dressage. Good luck with your fit appointment. I find it always worth the money for fitter, vet, etc appointment when it stops me from endlessly debating an issue. The saddle fitter should give you the real scoop and then you and Ri can move to the next step. You certainly shouldn't have to feel embarrassed at getting someone else out! Its your horse, your money and so you do what's best for you! Around here, an awful lot of people use the 'accredited' fitters from a chain saddlery. As far as I'm concerned, they're a load of bull. Got told numerous times my saddle fit my horse, she just needed more topline to stop the saddle slipping forwards. That's all very well and great, but building up the topline whilst practically sitting on my horse's shoulder isn't exactly ideal! Went off and got an independent fitter who has a much wider variety of brands. Tried out a couple of saddles, found one that fit and couldn't be happier with it! Yet I still see so many people spending a fortune on these saddlery fitters, getting them out again and again to adjust the saddles when half the time the saddle (usually of the brand the store pushes) simply don't fit their horse. I made the leap to switch horse dentists, because it became clear that the barn choice was not able to address the back of my horse's mouth. When I revealed my plan to the barn owner, she warned that if I dropped the current dentist, he might get mad and refuse to take me back. Sheesh. As if I wanted him back and since when was business like dropping a bad relationship? I never looked back. Ego plays in all arenas. We have shoers who won't listen to vets (because they wanted to be vets but either couldn't afford to go to vet school or weren't able to get into vet school). We have vets who are legends in their own minds and won't listen to clients, horses, or each other. There are breed-blind trainers, judges, owners--who can't see beyond the [pick a name] breed at the end of the halter lead. And there are saddle fitters who are in it to SELL you something and will TELL you anything. It's good to have an unbiased person who KNOWS something about saddles and fit when it comes to the RIDER stand with you while you try out all these different models. The horse WILL tell you want he likes and doesn't like (witness Rileys' pinned ears). If you aren't sure how YOU feel or how you LOOK in the various saddles, that extra set of eyes on the ground will be priceless. I kept telling the guy who made my "custom in name only" POS that the saddle wasn't right--it didn't FEEL right and I wasn't comfortable in it. He assured me it was "perfect," but turns out the seat was too small and pitched me forward. It fit the horse fine, but that is only half the equation. My "trainer" at the time was clueless. An expensive lesson for me to learn and now I am incredibly gunshy. Of course, my horse isn't sound so getting a saddle is not in the picture. I'm using the "saddle fund" to pay the vet bills. Sigh. I will be honest. This is to the point of ridiculous. All we can do is the best we can do. At the end of the day, for your own health and your blog readers' sanity, you have to put it down at some point. I think I may have been right. You will make a decision someday, but if Riley has a normal "bad" or "punky" day, you will always wonder, in the back of your mind ... if you made the wrong decision. I won't even deny it. I do appreciate your honesty and for taking the time to write. I do listen, and incorporate, but in the end I'm gonna do what I'm gonna do. Keep posting! In reference to a previous comment, being a little "OCD" about things related to our horse's care and management is a good thing. An ill-fitting saddle is nothing to sneeze at. I tried to ignore a saddle that did not fit and then tried to fix it with shims and padding. After a year, I gave up and tried many different brands before I found one that worked. Saddle-fit is neither trivial nor simple and certainly not an illusion of smoke and mirrors. Now, one saddle brand/model that fits all horses? That is the illusion. I just don't want you to be up all night over it. Call it sort of a "pat on the back" and an "I get it." Not chastising you at all. I just think, of ALL people, you need to worry the least about whether you're making the right decisions because you are using logical thought and process of elimination ... which is what an intelligent person does. Sometimes, there is no perfect answer. There is just the best answer, given allowance for variables, at the end of the day. The vet writes "WNL" on lameness exams because he/she is admitting there is no perfection; there is just "within normal limits." You are not as likely to abuse or lame your horse with a poorly fitting saddle than you think. As for "OCD" ... I think all of us participate in a tidge of that at some point or another ... be it over a fly mask color or the thickness of a stirrup leather. Bad or good, I just want you to sleep well at night knowing you have tried all you can, and that really does mean something after all.